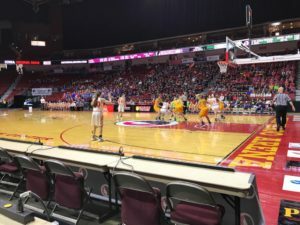 Cascade made three free throws in the final 12 seconds of the game to edge Central Decatur 59-56 in a class 2A quarterfinal round game. Cougar freshman Nicole McDermott finished with a game high 18 points and connected on a pair of free throws with five seconds remaining. Cascade trailed by eight points in the third quarter but turned the game around with a 17-0 run. Raegan Boothe led Central Decatur with 16 points and Lily Simon Added 15. The loss was the first for the Cardinals who close out the season with a record of 24-1. Cascade (23-2) advances to play No. 2 Treynor in Thursday’s class 2A semifinal round. The other semifinal game will match No. 1 Iowa City Regina against Western Christian.